Ahead of Sunday's Milan derby, we unveil our combined XI from AC Milan and Inter players thanks to Opta. A city divided on and off the pitch. Sunday's derby will pit AC Milan against bitter rivals Inter – a Serie A blockbuster with Champions League implications. In-form Milan occupy third in the table, a point above Inter ahead of the San Siro showdown. Milan have won five straight league games and are unbeaten in their past 10 matches in all competitions under Gennaro Gattuso, while Inter have struggled for consistency amid the chaos surrounding Mauro Icardi's future with the Nerazzurri. Ahead of the 223rd Derby della Madonnina, we unveil our combined XI from Milan and Inter players thanks to Opta. The selection set to raise most eyebrows, Handanovic gets the nod over Gianluigi Donnarumma. Both goalkeepers have made 27 appearances this season, but new Inter captain Handanovic – who has conceded one less goal than his rival with 22 – has kept 13 clean sheets, compared to Donnarumma's nine. The 22-year-old Italian – who has been linked with Manchester United among others – slots into the right-back position, ahead of Inter's Danilo D'Ambrosio. With 40 tackles won (15 more than his counterpart), 27 interceptions (seven greater than D'Ambrosio) and 94 successful duels, Calabria has continued to impress this season. Another Milan full-back makes it into the XI, with Kwadwo Asamoah overlooked in favour of Rodriguez. The Switzerland international has been a mainstay down the left for Gattuso and Milan with 25 Serie A appearances. Rodriguez has provided three assists, completed 1,231 successful passes at left-back and won 20 tackles – areas all superior to Asamoah. The Milan captain and face of the future, Romagnoli is enjoying another stellar campaign. The 24-year-old Italy centre-back has proved to be a rock at the back for the Rossoneri, while chipping in with two goals. De Vrij has slotted in seamlessly alongside Milan Skriniar following his free transfer from Lazio. The Dutchman has made 21 interceptions in 22 games, even scoring a goal in the process for Inter. Inter gave up a lot when they parted with cash and young midfielder Nicolo Zaniolo for Nainggolan from Roma. The experienced midfielder, however, is starting to prove his worth after a slow start. Reunited with Luciano Spalletti, Nainggolan has three goals and as many assists in 19 appearances. Brozovic has come into his own this term. After helping Croatia reach the 2018 World Cup final, Brozovic has won 139 duels – the most of any player in the combined XI. The 26-year-old has also won 56 tackles, 36 interceptions and completed a team-best 1656 passes to go with two goals and an assist. He provides pace, power and penetration. Kessie has earned plenty of admirers following his exploits for Milan, who have benefited from his four goals and an assist in midfield. His break-up play – highlighted by 23 interceptions – have proved priceless. One of the first names on the teamsheet at Milan – Suso has flourished after arriving from Liverpool in 2015. This season, the Spanish playmaker has dished up eight assists and scored five goals – well ahead of Inter winger Ivan Perisic, who has found the back of the net four times and posted just two assists. While Perisic has struggled to replicate his destructive form of previous seasons, Sassuolo loanee Politano – who can sign for Inter permanently at the end of the campaign – has picked up the slack with four goals and three assists. 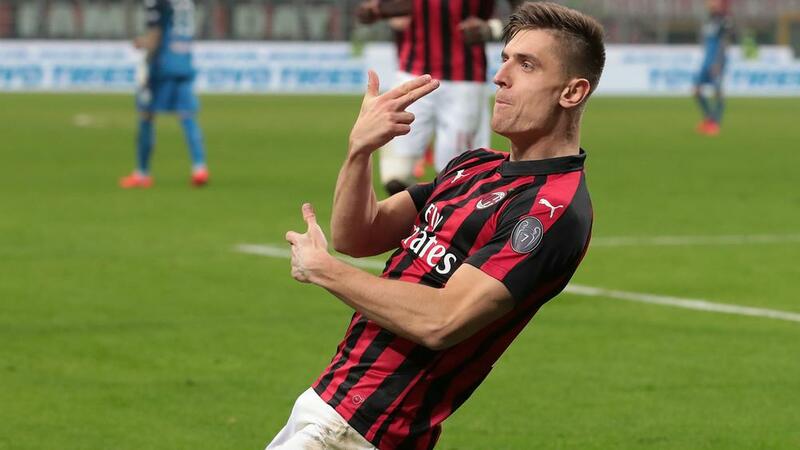 Piatek has renewed hope among Milan fans. When Gonzalo Higuain's unsuccessful loan spell came to an end in January, the club's hierarchy turned to the Polish sharp-shooter. And Piatek has delivered with six goals in seven Serie A appearances since leaving Genoa, where he scored 13 times for an overall tally of 19 – only one behind league leader Fabio Quagliarella, level with Juventus star Cristiano Ronaldo and 10 clear of Icardi.